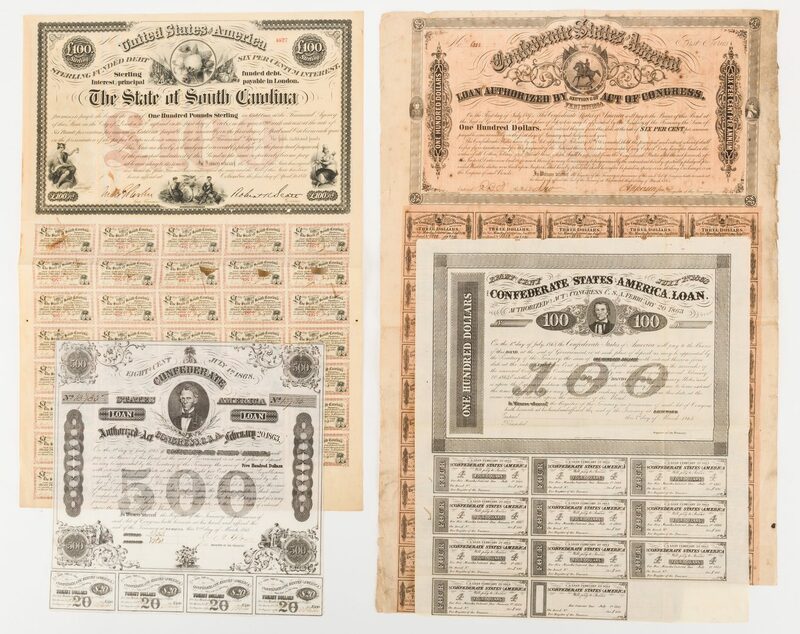 Three (3) Confederate States of America (CSA) Bond Loan certificates and one (1) South Carolina Bond Note, 4 items total. 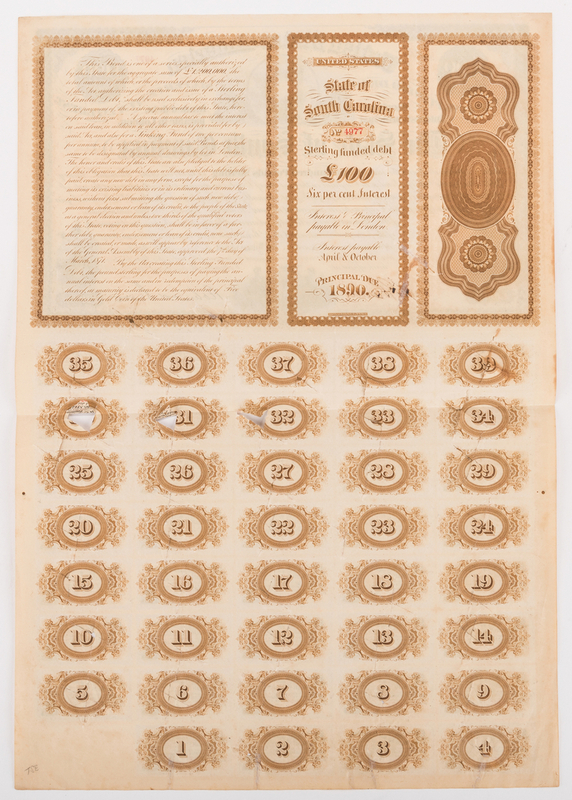 1st item: CSA $500 Bond Loan certificate, dated March 2, 1863, Serial Number 13735, issued in Richmond, VA, signed by Charles A. Rose for the Registrar of the Treasury. Central vignette of Christopher Gustavus Memminger. Four coupons remain. 12" H x 12" W. 2nd item: CSA $100 Bond Loan certificate, First Series, Serial Number 6223, issued in Richmond, VA, signed by E. Apperson for the Registrar of the Treasury. Central vignette of a figure on horseback. Fifty nine coupons remain. 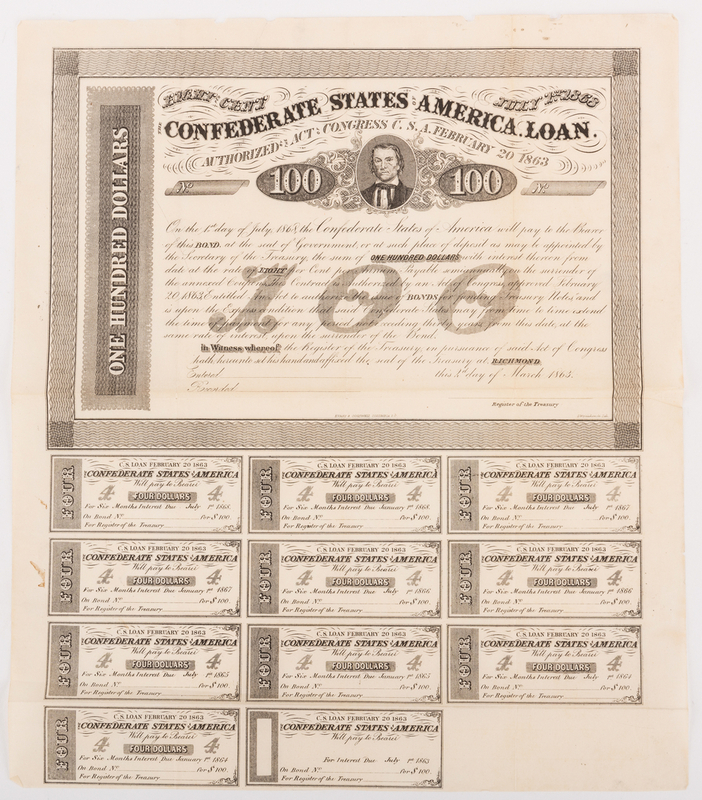 26" H x 17" W. 3rd item: CSA $100 Bond Loan certificate, dated March 2, 1863, no serial number, issued in Richmond, Va, unsigned. 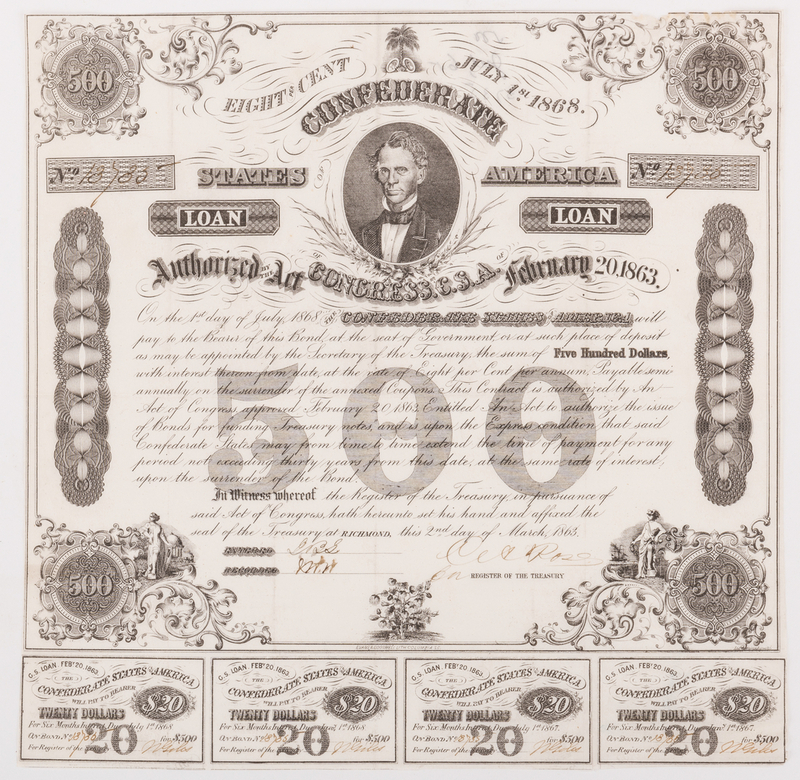 Central vignette of Alexander Hamilton Stephens. Eleven coupons remain. 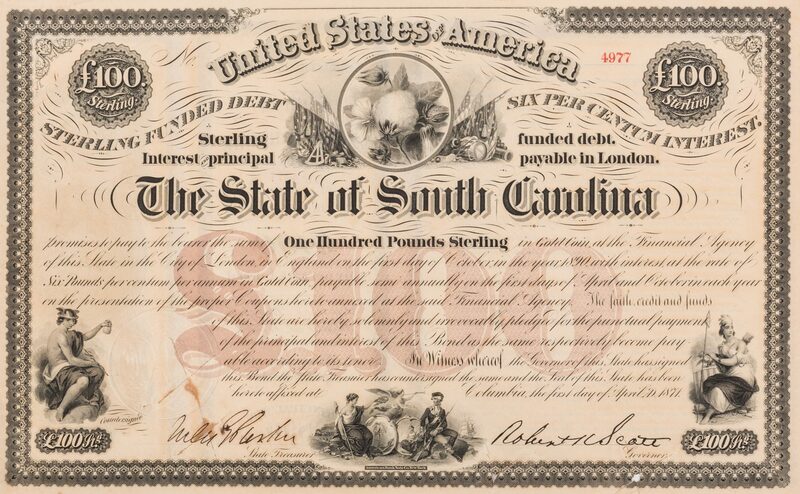 16 1/2" H x 14" W. 4th item: South Carolina 100 British Pound Sterling funded bank note, dated April 1, 1871, Serial Number 4977, issued in Columbia, SC, signed by Niles G. Parker, State Treasurer, and Robert H. Scott, Governor. Central vignette of cotton, allegorical vignettes, lower left, center, and right. Thirty five coupons remain. 21 3/4" H x 15" W. Mid/late 19th century. CONDITION: 1st item: Overall very good condition. 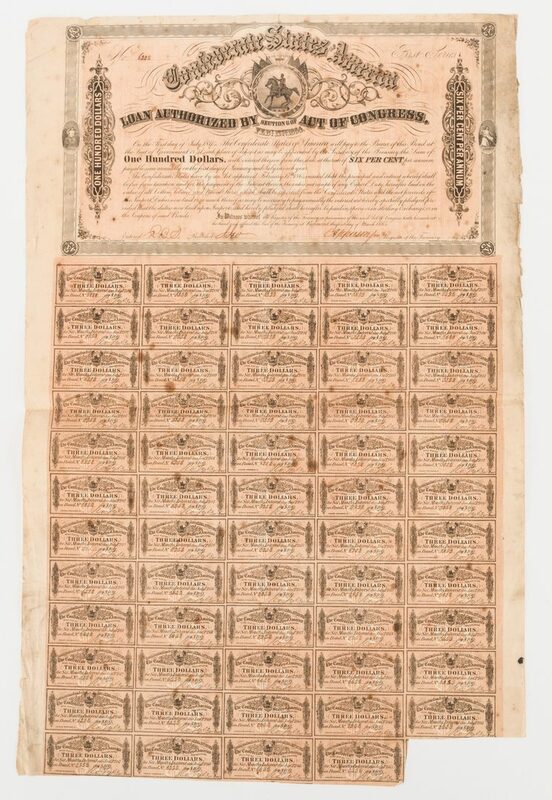 Few tears, largest 3/4", top right edge of sheet. 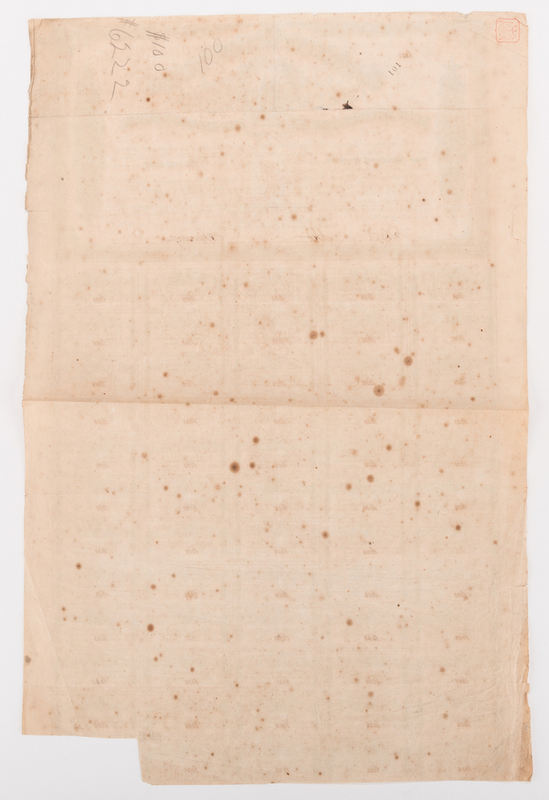 2nd item: Heavy foxing stains, surface and en verso of sheet. 3/4" area of clear tape repair, top left edge of sheet. Tears, largest 1 3/4", edges of sheet. Creases, wrinkles, surface of sheet. 3rd item: Overall good condition. 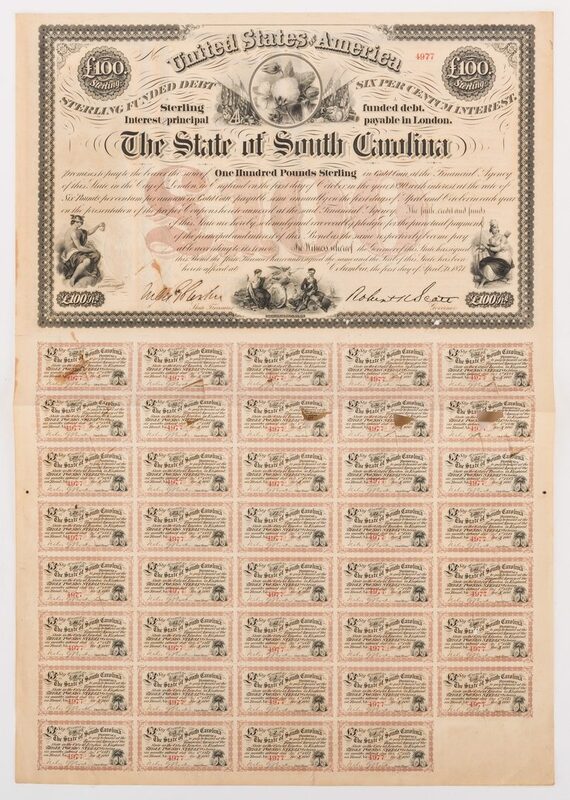 Few tears and stains, largest 1", surface of sheet. 4th item: Overall good condition. Toning, edges of sheet. 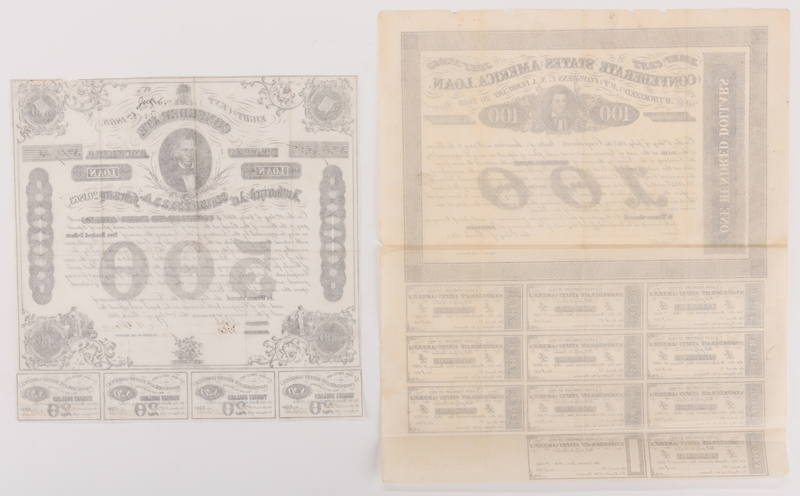 Coupons and signatures crossed out with a "X".